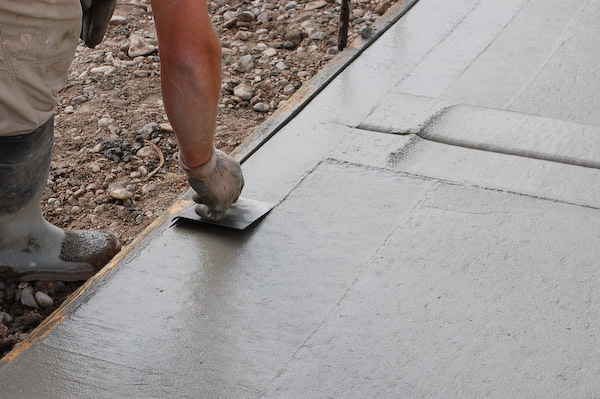 If you are thinking about a concrete patio or a new driveway, it is good to know what are the concrete types and what kind of concrete you can have. What can it be and how can you expose it? Exposed aggregate concrete is a type of decorative concrete, which reveals the true beauty of concrete. It is not only looks very good, but also is durable and skid-resistant material. 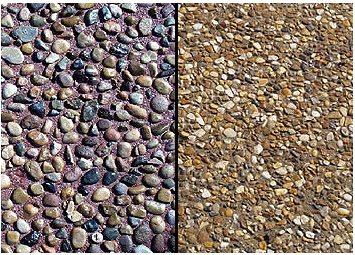 Exposed aggregate concrete is achieved by removing the top layer of cement paste and revealing the underlying aggregate. It does not doesn’t cost a lot, to create this decorative effect, because not much additional materials needed. Basically, you need a surface retardant, sprayer and a garden hose. It is a fairly easy task to do and not require long time or specific professional to do it. Monolithic – the aggregates are batched right into the concrete truck at the concrete plant. 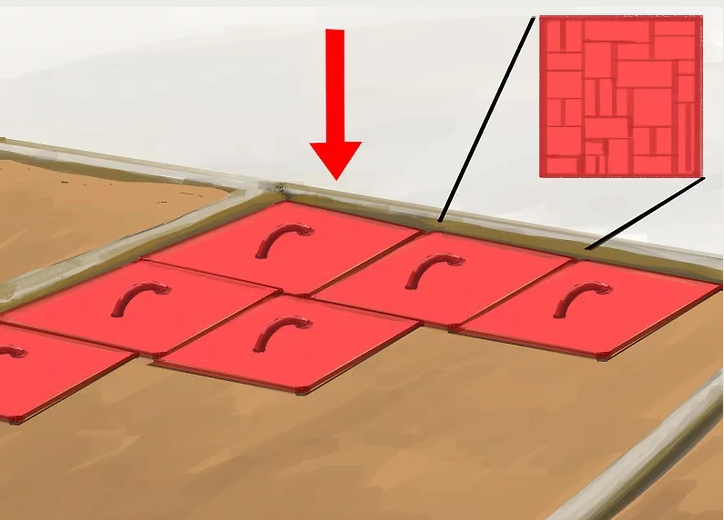 This method is the easiest and most commonly used. Smaller aggregate is typically called Pea stone. Seeded – immediately after the concrete is placed the decorative aggregates are broadcast, or hand placed, onto the surface of the concrete and floated in by hand. Overlay – this method is used on existing concrete that is in a good shape. Aggregates are mixed into the overlay topping material and applied to the old concrete to give it a new look. The “secret” to exposing the aggregates is keeping the top layer of cement paste soft while the underlying concrete hardens. This is done by spraying on a surface retardant immediately after installing the concrete and aggregates. A few hours later soft cement paste can be rinsed away with a garden hose and the aggregate is exposed on the surface. The biggest benefit of the exposed aggregate compared to other decorative styles, is that this method looks terrific, but has the lowest cost. 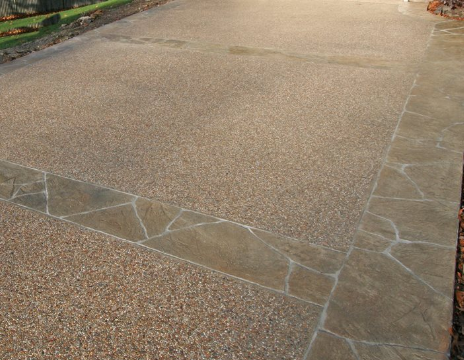 Stamped concrete also can be called textured or imprinted concrete. It is a concrete that replicates stones such as flagstone, tile brick and even wood. This type of decoration is perfect for pool decks, driveways, entries and patios. 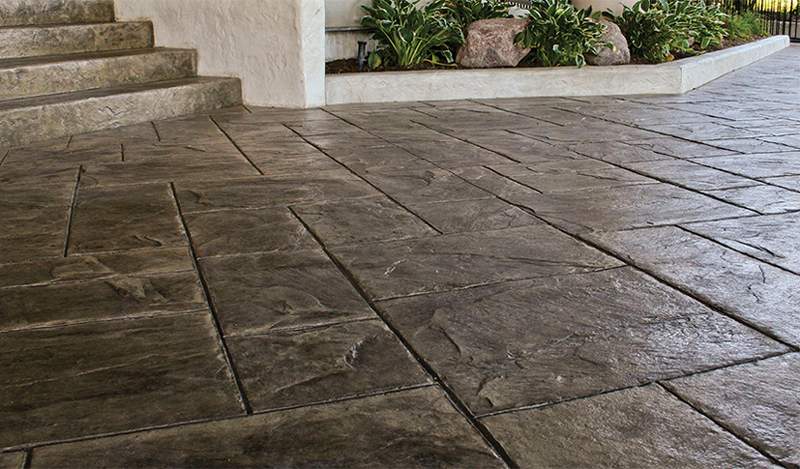 Stamped concrete is a very popular option among homeowners because if offers wide variety of patterns and colors, and with all that it is much cheaper than real flagstone or pavers. So how stamped concrete is made? The main part is to do a pattern. After you pour a concrete, and it isn’t fully dried, you need to use texture press, so you stamped your concrete with a pattern that you had chosen.